For years now, the Yakuza series has had a convincing claim to the title of the best games no one was playing. After the commercial failure of the first game, back in 2006, Sega barely bothered to localize the sequels, including nothing more than English subtitles for the American market. Yet even that worked to its advantage. The Yakuza games are so strange, and so defiantly Japanese, that English-language vocals actually detract from the experience. These are games that must be experienced in their purest form. All this is a roundabout way of saying that the newest installment, Yakuza: Dead Souls, sounded like a slam dunk. Take the series’ trademark convoluted storylines, ridiculous sidequests, and bizarre characters, and add a zombie apocalypse – well, how could it fail? The answer turns out to be: quite easily. Structurally, Dead Souls is no different from its predecessors. It’s an RPG, heavy on the cutscenes, with freedom to explore sidestreets and back alleys for sidequests that have nothing to do with the main plot. The key difference is in the combat engine: past Yakuza games have centered on brawling, replacing the turn-based battles of most RPGs with a brutal hand-to-hand fighting system. Not exactly complex, the fisticuffs nevertheless unfolded with a tactile fury, and players were encouraged to pick up various objects to club their opponents over the head. You haven’t lived until you’ve cleared out a room full of thugs with nothing but a potted plant. For whatever reason, Dead Souls jettisons the fighting in favor of gunplay, which would be a neat change if the controls weren’t god-awful. Whatever else you might say about the game’s virtues, the bare fact is that the moment-to-moment experience of playing it is excruciating. Nothing works right. For instance, when you press the L2 button, your crosshair is supposed to snap to the nearest target. What’s frustrating isn’t how rarely this works – it’s how unpredictably it works. You can’t even accommodate for bad mechanics because it feels like a roll of the dice every time. When you try to use precision targeting, the aiming is mapped to the left analog stick, which is the opposite of every other shooter out there, and which never feels natural no matter how long you play. It’d be one thing if there were some compelling reason not to map the action to the right stick, but there isn’t. It’s just a bad design choice. The list goes on and on. The camera doesn’t move to show an attacking enemy, but it does tend to reject your attempts to guide it to where you want it to go. Your character doesn’t auto-target when meleeing, so he often flails into empty space just to the side of an enemy. Lengthy, elaborate animations must be completed before you can input another action, so quick dodge moves are out of the question if you’re in the midst of re-loading. Nothing about it feels right. And unlike classic Yakuza games, Dead Souls is almost all action sequences. It has its share of goofy sidequests, but these, too, are almost all shooting-based, which makes the thought of starting a new one rather unappealing. Frankly, I never thought the day would come when I’d play a Yakuza game and purposely skip the sidequests. It feels like having a birthday without cake. The series’ sense of humor is intact, as is the generally high production value. The fashions, the performances and the staging of the cutscenes are all terrific. It’s de rigueur to bag on cinematics these days, but they’re a treat in Dead Souls, and not only because they interrupt the generally excruciating gameplay. But even the storyline is a step down from the series’ standards. You could argue that, after four increasingly convoluted soap-opera-like crime sagas, Yakuza was due for a shakeup. But a zombie outbreak yarn is not exactly what the doctor ordered, especially when it seems itself to be constituted of parts from other, better games. 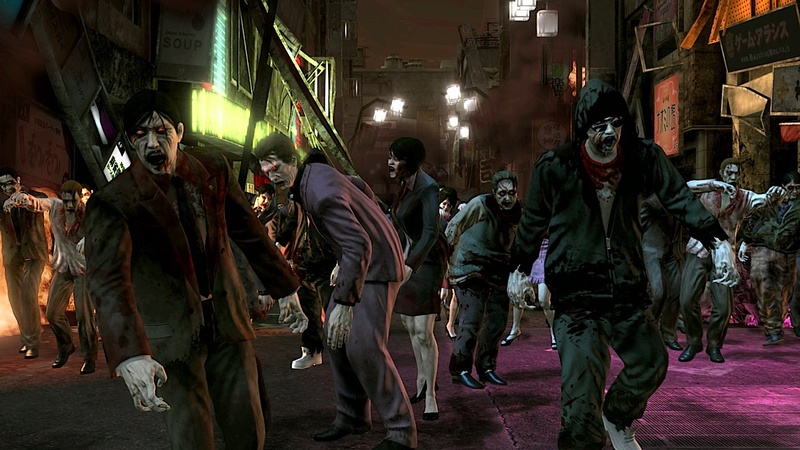 Dead Souls even includes “special” zombies ripped straight from Left 4 Dead. There’s a frail lady zombie who screams like the Witch, a monkey-like zombie that leaps like the Hunter, and, most egregious of all, an obese belching zombie that looks exactly like the Boomer. Except here it’s called a “Fattie.” There’s homage, and then there’s theft. It would be a shame if Dead Souls were someone’s introduction to the world of Yakuza. The earlier games are still waiting to find the audience they deserve, and no one should be put off by one misstep. Fortunately, if the past is any guide, no one will play this one, either. Mitch Krpata is a freelance writer based in Boston. His work has also appeared in the Boston Phoenix, Slate, Joystiq, Joystick Division, and the book 1001 Video Games You Must Play Before You Die. Follow him on Twitter @mkrpata, or check out his blog, Insult Swordfighting.